Dr (TCM) April Kim is a doctor of Chinese medicine and graduated from Beijing University of Traditional Chinese Medicine with a Bachelor of Medicine and a Bachelor of Science degree in Traditional Chinese Medicine in the UK. The full time, five year degree included six months internship at two of the largest hospitals in Beijing, China. The placement consisted of time spent covering a wide range of areas, such as cardiology, neurology, respiratory, gynaecology, dermatology, traumatology and paediatrics. 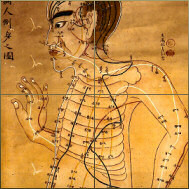 Since then, Dr (TCM) April Kim has undertaken several post graduate courses including working with the renowned acupuncturist at Zhong Ri hospital in Beijing, Dr Yu Lan Bai, China's leading neurologist, where April Kim studied the art of abdominal acupuncture (Fu Zhen). April has several academic articles published in medical journals, healthcare magazines and medical web sites. To read these articles and discover more about Chinese medicine click here. April is a member of the British Acupuncture Council (BAC), The Association of Traditional Chinese Medicine (ATCM) and the British Fertility Society. All members are bound by a strict code of ethics and conduct and are legally insured.